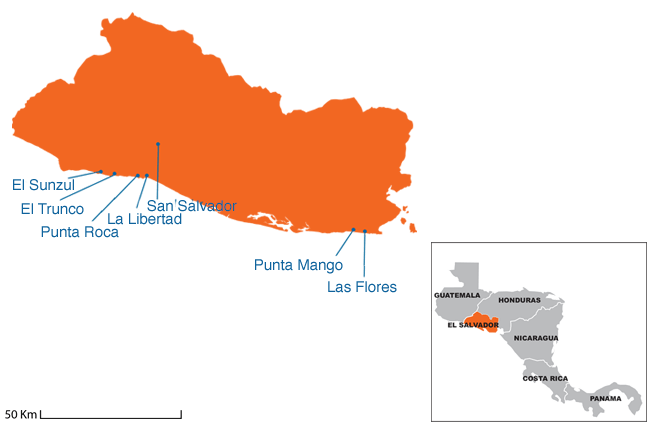 El Salvador, which means ‘Republic of the Savior’, is bordered by Honduras and Guatemala and has a patchy surf history due to the civil war (1980-92). The first reported surfing in El Salvador was when Robert "Roberto" Rotherham decided to leave California’s crowded point breaks and drive in a beat-up Volkswagen in search of empty waves… he ended up arriving on the Pacific shores of El Salvador. Roberto quickly became attached to the laid-back beach lifestyle and a local woman, in addition to the fantastic El Salvador surf he found at the beach breaks and point breaks. He had found paradise, but only temporarily, as a civil war broke out amongst the right-wing, U.S.-backed government and leftist, Soviet-backed rebels. Massacres and guerrilla attacks became the norm which,unsurprisingly, stopped foreign tourists coming to El Salvador's beautiful coastline. This didn’t deter the locals though, it was a half-hour drive from the capital and the residents in San Salvador took full advantage of this as it was a peaceful escape from the city and conflict. They could relax in thatch-roofed eateries overlooking the ocean, enjoy cold drinks relax on the golden sands and take to the El Salvador surf spots away from the troubles in the city. During this turbulent time, only the most hardy, fearless surfers visited. It was only in 1992 when the war ended that surfers, both national and international, gradually started to trickle back and El Salvador surfing slowly returned to the scene. Now you will find a core group of locals at many of El Salvador’s breaks and capitalising on the surfing industry by setting up restaurants, shops, accommodation and beachside shacks for the visiting ‘surfistas’ who take full advantage of the El Salvador surf resorts. What's the surf like in El Salvador? El Salvador’s coastline is riddled with right point breaks, a regular foot’s dreamland, whilst also offering up some great and uncrowded beach breaks that dish out left and right peaks. El Salvador surf spots might be some of the most consistent surf breaks in the Central America. You will find great waves all year round with the best time to visit between March and October when the swell will rarely drop below waist height. This makes it perfect for someone’s first foray into surfing, but bigger swells can produce head high over swells, once or twice a week, which will appeal to surfers looking to progress their skill to the next level. More specifically, March and June is a great time to stay at an El Salvador surf camp for what is considered the ‘pretty wave season’; this is when the rainy season starts to get underway and southerly swells start to filter in. The water clarity is at its best this time of year as the rain that filters down towards the ocean from the mountain sides are yet to arrive. This is the optimum El Salvador surf season to visit for surfers of all abilities. La Libertad is the most popular surf destination in El Salvador, additionally being particularly popular area for non-surfers as well. A bustling fishing port, it’s best known for undoubtedly the country’s most famous wave, Punta Roca, which was dubbed the ‘Latin American J-Bay’. The Punta Roca offers surfers some incredibly long right hand walls, perfect for regular footers looking to progress at this intermediate surf El Salvador break. Another great wave in the La Libertad area is Bocana, which offers mostly right hand waves, and the occasional left hander, that breaks over a mix of sand and rocks. These waves break slower than Punta Roca, so is an ideal spot for beginners and wonderful place to base for your El Salvador surf holiday. Some great waves can also be found at Conchalio point break, as well as some great empty left and right hand peaks at Playa El Obispo. In between sessions at a stay in an El Salvador surf camp, walk around the dock and enjoy some of the freshest seafood you can get and wash it down with a cold, national beer. There are many restaurants along the beach where you can enjoy national dishes, prepared exquisitely right on the sands, making for unforgettable experience. El Tunco is 40 minutes away from the International Airport of Comalapa and the city of San Salvador. The main beach at Playa El Tunco is perhaps the most visited beach by travellers, not just for the surf, but for the magical atmosphere the town alludes, with plenty of restaurants, bars that play some great live music and natural beauty that is a treat to the eyes. This area is the place to head for those wanting their surf camps El Salvador to have a lively party vibe. For beginner surfers, this town will be a real draw as it’s home to Playa El Sunzal, an incredible right hand point break that offers long rides of up to 150m, an ideal platform for long-boarders and beginner level surfers and one of the top places to base your El Salvador surf camp. There are many uncrowded beach breaks between Bocanita and Sunzalito, where you will find top quality left and rights for surfers of all abilities. The east coast of El Salvador is the place to head for relaxing times, unrivalled beauty and many of the best El Salvador surf spots that have not been named. Known as the ‘Wild East’ this is the perfect location to explore the wonders of the jungle and experience small beachside villages that exude friendliness. It’s a fantastic place to take part in fishing excursions when you need a break from the area’s great waves. Nestled on the fringes of the jungle landscape is a host of great waves, from uncrowded beach breaks to more right hand point breaks that are considered world class waves. Las Flores is the crown jewel, not only is it in a picture postcard location, it offers up incredibly long yet mellow walls. For the more adventurous, you can rent a boat and visit Punta Mango point break which produces long barrels and great waves to learn to surf. El Salvador has it all! El Salvador surf resorts are blessed with some of the most gorgeous weather and water temperatures. El Salvador’s dry season, known locally as ‘Verano’, runs between November and April, with a rainy season known as ‘Invierno’ between May and October. In the rainy season, coastal and central regions typically encounter afternoon storms that last only a short amount of time, with great weather either side of this. 1. Coastal areas are hot throughout the year, with temperatures rarely dropping below 29°C during the day and 21°C at night. 2. The central plateau shows more extremes of hot and cold, this means it drops to temperatures typically experienced in northern Europe, with it rarely dropping below 10°C at any point. 3. Finally, the upland areas of El Salvador have a more stable and cooler climate, with temperatures ranging between 20 and 25°C during the day.The water temperature here stays pretty much the same all year round, hovering between 26 - 28°C; you may want to pack a wetsuit top to offer you a bit of protection from the early morning breezes. Many people wear small wetsuit boots known as reef boots, these allow for adequate protection for the feet when surfing point breaks and reefs, however they do not need to be worn at the beach breaks.